So the Florida Court of Appeal held Wednesday in Norman v. State. It concluded that the Second Amendment applies to carrying for self-defense outside the home. The Legislature “has a right to prescribe a particular manner of carry, provided that it does not ‘cut off the exercise of the right of the citizen altogether to bear arms, or, under the color of prescribing the mode, render the right itself useless.’” The Legislature is permitted to regulate the manner in which arms are borne for the purpose of maintaining public peace and safety, so long as any such regulation leaves available a viable carry mode. So let’s play a thought experiment. Suppose rather than the rights of an “ordinary” citizen being addressed here it was the rights of law enforcement officers who may need to defend their lives. Would Eugene have made the same argument? Would law enforcement have stood for being told they must carry concealed? Would any court in the land have dared to force LEOs to carry concealed? Do you think law enforcement would make the argument that drawing from a concealed carry position (IWB covered by clothing or perhaps ankle carry rig) might endanger their lives more than if they have the weapon ready from open carry due to response time? Remember under Tennessee versus Garner LEOs can use their weapons for the very same reason we can use ours, i.e., for self defense or the defense of the life of someone else (or to prevent assault or bodily injury), and for no other reason(s). So then how are we any different than LEOs, and why should such requirements be placed on us if they are not placed on LEOs? How is it the right decision by the court to uphold a law that treats us differently? Surely Eugene knows as much about Tennessee versus Garner (and its follow-on cases) as we do. Does Eugene have an answer for why it’s okay for the court to treat us differently? Has Eugene thought through this clearly enough yet? More fundamental, of course, is the fact that the very reason that for the citizenry to be free, we must have a right to keep and bear arms (not, readers will note, a “right to keep and bear sporting goods”) that shall not be infringed, is that we must have access to weapons with which we can pose a credible threat to the government’s enforcers, if that government makes such action necessary. The M855 rounds are a part of that credible threat–and that is undoubtedly why this administration is trying to neutralize it. It’s always good to hear truth-telling. Kurt’s comment that we must have access to weapons with which we can pose a credible threat to the government’s enforcers, if that government makes such action necessary” exactly captures the intent of the second amendment and the experience of the founders. Per Denise Brown of ATF Enforcement Programs and Services in this afternoon’s telephone conversation, this will “not actually be a [regulatory] change, more of a policy along those lines.” Brown said the framework document is a notice only, and will therefore not be published in the Federal Register, characterizing the document’s intent as “information gathering” in order to collect technical information, which could affect the Bureau’s final determination. How many angels can dance on the head of a pin? It sounds as if the ATF thinks they have found a legal (or pseudo-legal) way around following the rules. This is what your tax dollars do when they hire lawyers for the DoJ. Yea, those dollars. Those hard earned dollars you make with blood, sweat and tears, those dollars that cause gray hair after so many years of fighting the system, or the ground, or those machines. Those dollars taken from you by the power of a badge and gun. The trick is how do we maintain our rights when all the branches of government in a given state — the legislative, judicial and executive backed up by their willing handmaidens in the press (try looking in a mirror) — are in the hands of people whom the Founders would deem “domestic enemies of the Constitution.” The residents of the aforementioned states have answered that question by refusing to comply and daring the “authorities” to do anything about it. Refusing to comply and daring the authorities to do anything about it. It really does point to a problem of courage on the part of the authorities, doesn’t it? A law enforcement officer was injured when his gun accidentally discharged at the Cook County Courthouse in Bridgeview. No one else was hurt. The officer was transported by ambulance with a gunshot wound to his leg from the courthouse at 10220 S. 76th Avenue shortly before 10 a.m., according to the Cook County Sheriff’s Department. The officer is expected to be OK. No one else was injured. Earlier Wednesday morning, an alarm at the courthouse malfunctioned, forcing an evacuation of the building. The officer was retrieving a gun from a locker it went off. I just can’t tell you how many times that has happened to me. A Texas police chief belittled an open carry activist who claimed there was an easy way to determine who was a “bad guy” with a gun. Chris Hall spoke out last month during a rally at the statehouse organized by Come and Take It – Texas, saying there’s little reason to fear someone openly carrying a gun around in public. But Ray Hunt, president of the Houston Police Officer’s Union, dismissed the pro-gun activist’s comments as ridiculous. Hunt admitted that concealed carry did not create some of the problems that police feared, and he said officers would adjust if open carry is passed. “It clearly is going to make our job different and more difficult, but not something that we can’t live with,” he said. Houston’s police chief said open carry would make police work even more dangerous. “As a police chief trying to keep two and a half million people safe, I’m just opposed to inserting more guns into a situation that I feel like could cause more harm,” said Houston Police Chief Charles McClelland. Hunt is lying and he knows it. Nothing about open carry will make his job more difficult. It many ways it might be easier. As for the Houston Police Chief, he has his own problems that should occupy his attention rather than allowing progressive political causes like gun control to consume him. So tell me again, just who are these criminals who open carry, and who will make life more difficult for the police? Much like a muscle that atrophies with disuse, any right that goes unexercised for many years devolves into a privilege, and eventually can even be redefined as a crime. If we want a culture where open carry is once again the norm, the only way to effect that change is to open carry on a regular basis to make it the norm. Recall that I told you “that Rock River Arms, Knights Armament, LaRue Tactical and Daniel Defense isn’t the Colt produced under milspec for the Army and Marine Corps (these are all superior to the Colt M-16 and M-4)?” And recall that John Jay and I have both discussed Milspec and what it does (and doesn’t) mean? And at Western Rifle Shooter’s Association I have had this discussion in even more detail. While some features of some AR-15s (that don’t match Milspec) are positive, like the Wylde chamber which is highly acclaimed), some not so much. For example, RRA uses red Loctite on the Castle Nut, a feature many guys who do their own build don’t like much. Listen, as an engineer (PE), I can tell you how I would approach it. I would take several rifles from different lots and measure the crap out of each and every tolerance (including head space, chamber, leade, etc.) before passing the design and saying it met my specifications. If I say that some specific part used SS304, I would send that part out of rifles with different lots to be melted down, and a spectrographic analysis done to determine if the Mn, Cr, Co and other elements were within tolerance. One slipup means the whole lot gets rejected. And that’s the way the mechanics and engineers at the Picatinny Arsenal will approach it too. Milspec means something very specific, good in some instances, perhaps not keeping with current design improvements in others, but simply meeting the original order specs sent by the engineers. Well, the Marine Corps is upgrading their rifles. MARINE CORPS BASE QUANTICO, Va. – If the Marine Corps’ top marksmanship experts get their way, Marines are going to get a rifle retooled with an array of upgrades that will make them deadlier shooters. They recently directed the study of a number of significant changes to the service’s weapons, ammunition, shooting curriculum and ranges and have approved new competitions. Most eagerly anticipated are recommendations to study overhauling M16A4 rifles and M4 carbines with a host of new features, including a new trigger and barrel, all of which will be a hot topic at the next Combat Marksmanship Symposium in October. Current M16A4 rifles and M4 carbines could get a significant overhaul with mostly inexpensive components already available to consumers. The upgrades would drastically improve accuracy and function without incurring the expense of procuring an new rifle. Those updates could include a free-floating barrel, rifle compensators, new reticles for the Rifle Combat Optic, more ambidextrous controls and a new trigger group. With significant advancements in rifle technology for the civilian shooting market over the past two decades, those are all features commonly seen on competition rifles and those carried by elite operators. Standard-issue M16A4s and M4s use hand guards and rail systems that are directly connected to the barrel. As a result, any force exerted on an accessory like a rifle sling used to achieve greater stability also exerts force on the barrel. That can ever so slightly bend or pull the barrel off center relative to zeroed optics. The movement can translate into big variances over distance. The longer the shot, the further the external pressure exerted on the barrel will throw it. A free floating barrel is achieved by using a hand guard and rail system that does not contact the barrel at any point. So any force exerted on a sling or other rifle-mounted accessory attached to the rail system does not translate to the barrel which contacts the rifle at only one point – the upper receiver. That ensures the barrel and optics which are also mounted to the upper receiver point in precisely the same direction. This is a very odd way of explaining it. Rifle optics can be set up with the assistance of a bore sight to zero at about 25 yards (which zeros the 5.56 mm at 100 yards too without BDC), even given the small undulations in the barrel. That’s not really the issue. The issue has to do with the fact that if it is not a free floated barrel there is a hinge point, or a fixed point beyond which the barrel cantilevers. This point interferes with the natural frequency of the barrel and thus alters the harmonics of the system. The vibrations send the projectile off directions other than the direction of the bore (at static conditions) without the vibrations from the explosion. With an anchor point for the barrel, this smooth sinusoidal wave of vibrations becomes an interrupted mess of multiple competing and non-metered or oddly-patterned waves. The point is this: barrel anchor points = bad, free floated barrel = good. As I said before, purchasing something Milspec isn’t always the best option, and in most instances today with the progression of technology since mid-twentieth century, it leads to inferior design and manufacture. WeaponsMan also has a good article on Making an M4 Run Like A Gazelle. David goes on record at Guns Magazine trying to convince hunters and other sportsmen (not the first time he has tried) to be wary of so-called “environmental” and gun control groups and alliances with such ne’er-do-wells. I just don’t see what the debate is all about, despite one commenter. If hunters think for one second that any single so-called “environmental” group or other gun controller has their interests at heart, or cares one iota about game management practices and herd size and health, or the availability of nice bolt action guns for the hunters, they are too stupid to be running around in the fields or in deer stands with guns. The gun controllers think that bolt action rifle of yours with high powered glass is an evil “sniper rifle.” And they don’t want you to carry a handgun to dispatch wounded deer quickly and humanely, because they wouldn’t allow you to shoot the deer at all. Also note that Kurt Hofmann brings up one issue that I’ve brought up in the past. A leading local civil rights attorney was arrested over the weekend at Cleveland Hopkins Airport for having a concealed handgun in his carry-on bag, The Plain Dealer reported Sunday. David Malik, the original attorney for the family of 12-year-old Tamir Rice who was slain by police in November, spent the night in jail after a .22 caliber handgun and a box of ammunition were discovered by airport security. Not me. Laws are for the little people, not those who would rule over us. Yes they are, and yes they are. Suppressors are safety equipment, as much so as hard hats, safety glasses and SCBAs in confined spaces. And yes, the gun controllers are against any equipment that might save hearing. There is a dark morality to anti-gun beliefs, in that they don’t really care about people as they like you to believe. They only care about guns being in the hands of the ruling elite, or in other words, the government. No, Sebastian, I don’t want the federal government to allow “green tip” ammunition because it might be a good substitute for lead. I want to use lead too, and whatever else I want. It’s none of the government’s damn business and I don’t need a law substantiating my choices. So the Canadian armed forces are looking into a Bullpup design? Um, okay, whatever. That puts the explosion right at your ear, which is why I don’t have Bullpup rifles or shotguns. There is an awful lot of proposed gun legislation in West Virginia. Most of it looks good, at least what I saw. D.C. gun laws remain the same despite recent court ruling, because D.C. elites don’t care about the difference between right and wrong. 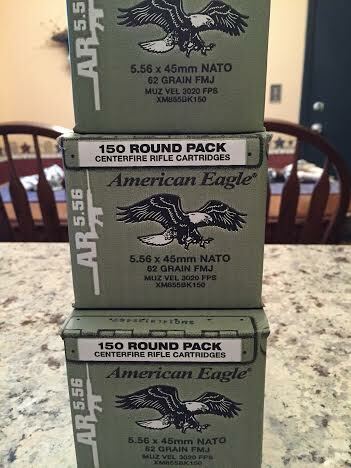 The Bureau of Alcohol, Tobacco, Firearms and Explosives posted a proposed rule change Friday removing a previous exemption and banning the manufacture, import and sale of “5.56 mm (.223) SS109 and M855 ‘green tip’ ammunition containing a steel core,” saying it now considers it to be “non-sporting” handgun ammunition capable of penetrating protective vests worn by law enforcement officers. This latest development, ceding to law enforcement lobby interests, is prompted by the development of handguns capable of firing the cited ammunition. “This ‘sporting use’ strategy was used before,” author and attorney Richard Stevens documented. “The Nazi Weapons Law (18 March 1938) forbade importation of weapons under substantially the same test.” Additionally, the intent of founders in drafting the Second Amendment makes no such exception to allow “sporting purpose” infringements, particularly by the federal government. Read all of David’s well-sourced article. Steel tip (aka “green tip”) ammunition is designed a little heavier for slightly different flight and terminal ballistics and better penetration at long distances. There are a host of reasons someone might want to have this ammunition, not all of which have to do with so-called sporting purposes according to the ATF. Then again, my definition of sporting purposes and the ATF’s definition of sporting purposes differ by a wide margin. The Sporting Purposes test should be found unconstitutional since the second amendment pertains to the amelioration of tyranny rather than hunting. The ATF has crafted a regulatory framework that contradicts and violates the intent of the founding fathers. Therefore, everyone who works for the ATF is undermining the constitution. On a personal note, I would like to thank Eric Holder for reminding me that it’s important to keep track of the good bargains in my area of operations. As for Holder and the lawyers at ATF who have crafted such statist regulations, and the Golgothan for whom they all work, you will see your maker soon enough and then answer for your sins. Among the more interesting data points – and there were a slew of them – to come out of Thursday’s Senate committee hearing on two high-profile gun bills was a recent survey conducted by the Texas Police Chiefs Association. – Nearly 75 percent opposed open carry in Texas. – 90 percent said that if open carry passes, a license should be required. – 94 percent said an openly carried handgun should have to be holstered. – 71 percent said that holsters should have retention ratings, which help secure the gun. Those include ideas mentioned on Thursday by Houston Assistant Police Chief Don McKinney: boosting the standards for training and holsters. They didn’t all respond to the questionnaire but its a fair assumption that these police chiefs are representative of the whole bunch. First of all note the man who brought all of this up to the committee – Austin Police Chief Art Acevedo. Acevedo is the chief cop who pressed for “no refusal” blood draws. That’s right, he believes that police have a right to strap your arm down and shove a needle in you to test for BAC. But then also recall that he believes gun enthusiasts need to be vetted by law enforcement. Finally, the presumed “concerns” and issues LEOs have with open carry have all been thrown around before. In fact, in Mississippi open carry was going to be the wild, wild West, and blood running in the streets. Except it wasn’t. Louisiana is an open carry state, but no one has been hurt from it. My own home state of North Carolina is a traditional open carry state. We still all go about our business as usual, women and children don’t run screaming in the streets, and men don’t run around crazy when they finally get to put their weapons outside their waistband instead of inside their waistband. The sad thing about the open carry bill that has made its way to the Senate is that it is licensed open carry rather than constitutional carry. The Texas LEOs see the devil around every corner, and bogeymen under the bed and in the closet. They sound like frightened little girls. Someone tell them that everything will be alright, and the sun will come up tomorrow. And for heaven’s sake, Austin needs to get rid of Art Acevedo and send him back to the hole from which he crawled. Can you do everything Travis does in this video? I like to provide training videos when I can, and since I can’t train you to do much, Jerry Miculek has to stand in for me.